Romancing the Stone: Sharon’s Got a New Man! “Extra” caught Sharon Stone making out with a mystery man in Malibu! Cameras caught the two snuggling on a beach and holding hands. The very public display of affection continued as the two went shopping. Sharon recently told “Extra” that her basic dating instinct is to wait for the right guy – especially with her three kids. 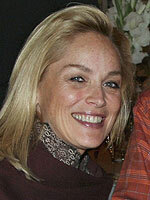 Click on an image to view the Sharon Stone photo gallery!